For three years, researchers from Montana State University spent their summers collecting bear hair. The samples, collected on both sides of the 50 mile stretch of the Trans-Canada Highway that cuts through Banff National Park, prove what the researchers had suspected: wildlife underpasses and bridges were helping enough bears move back and forth across the highway to keep the populations healthy. The Trans-Canada Highway stretches nearly 5,000 miles acrowss the country, rolling through each of the nation’s 10 provinces and connecting the Atlantic and Pacific coasts. The 100 miles that pass through Banff National Park is a blip in the entire stretch of highway, but a potentially deadly obstacle for the wildlife that live in the park. Demand for a bigger, faster road system prompted a widening of the highway in the 1990s. During construction, engineers lined the highway with fencing and built underpasses and bridges for animals to cross, with the theory they would reduce collisions and provide animals safe passage. However, the decision was controversial as there was little data to backup the hunch. Photo credit: Adam Fagen via Flickr. An overpass in Banff National Park, built just for wildlife, helps reduce highway collisions and connect fragmented habitat. Construction of animal crossings has skyrocketed since they were first implemented in the 1970s, and Rob Ament, director of the Road Ecology Program at Montana State University says that research has shown as much as 80 to 90 percent decrease in vehicle-wildlife collisions in areas with the structures. Yet without proof that wide crossings are crucial to wildlife, planners have been reluctant to keep building them, especially overpasses, which are more costly and time-consuming than underpasses. MSU’s bear hair study proves that not only do animal crossings benefit humans, but also that both underpasses and the more expensive overpasses may be critical to some species’ survival. Photo credit: B.C. Ministry of Transportation and Infrastructure, via Flickr. 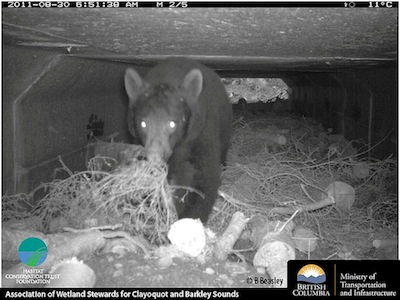 A wildlife camera captures this bear using an underpass in British Columbia. The crossings in Banff National Park include two wide overpasses covered in vegetation that helps them resemble the surrounding habitat. Underpasses provide the cover cougars and many small mammals need, while the bridges and overpasses let moose and elk traverse in their preferred open-sky habitats. Cameras at each of the passageways have recorded hundreds of thousands of crossings for many different species, including bears, wolves, lynx, deer, elk and moose. A wolverine made the news when a camera captured its walk across an overpass, becoming the first such venture recorded for its species. But cameras couldn’t help scientists collect data about individual crossings. “We could show that there were a lot of crossings, but what did that mean? Was it one bear crossing 100 times or 100 different bears crossing once?” Ament and the researchers at MSU wondered. Answering this question was critical to understanding overall health of the animal communities. What the researchers discovered was encouraging. Over the three-year study, 15 different grizzly bears and 17 different black bears used the crossings. While those may not seem like huge numbers, they represent a significant portion of the populations. Using estimates of the populations of grizzlies and black bears in Banff, these individuals represented close to 20 percent of the population for both species. Previous research estimates that, for large mammals like bears, about 10 percent of a population needs to cross back and forth to ensure a healthy ecosystem. Comparing samples from year to year and in different locations, the researchers can begin to construct family trees for the bears and observe genetic diversity in offspring. To collect the hair samples, researchers set up lines of barbed wire by several of the crossings. As bears passed, the barbs would snag a bit of hair. To learn about the bears’ movement once they crossed, the team also set up wires near trees that the bears used as scratching posts. Finally, they doused piles of wood 8.5 miles from the highway with cow blood and fish emulsion, a stomach-turning scent for us but an enticing curiosity for the bears. Again, when the bears came to investigate, barbed wire nearby would help keep track of which bears visited. Over three years, the team collected more than 10,000 strands of bear hair. In addition to finding out that the passageways helped keep the populations healthy, the researchers learned that grizzlies preferred the wide-open overpasses while black bears primarily used the underpasses. Roughly equal numbers of males and females for both species used the crossings, and the genetic sampling lets biologists know more about the population’s family trees. While the team could have chosen any number of species to monitor, they knew there were enough bears to collect significant data and, since scientists are concerned about their declining populations, the data could be relevant in broader studies. While animal crossings have proven successful in reducing wildlife collisions on highways and, now, in connecting fragmented habitat, they’re not the cure-all for animals who need continuous open space to roam. Crossings won’t solve the challenges faced along the pronghorn’s 120-mile migration by development. And, as editor Jodi Peterson noted, the fences and crossings don’t manage to keep every animal off the highway. However, as China develops its highway system at a rate of 5,000 km per year and Mongolia constructs its first paved highway, Ament is pleased that these countries are looking to Montana State University for expertise. “We are trying to encourage them to not do it like us,” he says, but rather, consider the ecology as an important component to their construction plans. Katie Mast is an editorial intern at High Country News.